Thanks to everyone who helped welcome Kevin home and helped get the house ready! Kevin’s glad to be here and is already hard at work getting acclimated. We’ll have photos of the homecoming soon. We are expecting a lot of visitors this weekend. Our doors are wide open, but just wanted to let everyone know that it may be tight depending on the time you get here. Any time after noon should be clear sailing. Kevin appreciates all the visitors and loves seeing everyone, so feel free to come by! Just a quick update today. We’ll have more soon! The day is almost here – Kevin will finally be coming home tomorrow afternoon! As much as he loves Magee, Kevin is excited to get settled at home and start making the most of his situation. Thanks to everyone who helped get our house ready for Kevin to come home. A few folks have expressed interest in welcoming Kevin home tomorrow afternoon. We certainly welcome anyone who is interested in attending to be there. Please note that we live on a small street and parking might be tight. Getting Kevin settled will be the first priority so we may have to keep visits brief. You will be able to visit Kevin in the coming days and weeks, but we ask for your patience as we figure out his routine and the best times for visitors. Over the first few days, we ask that folks just check in with Joe Neary, JP, or Chris to let us know you’re visiting. In general, it is best to wait until at least 11 a.m. to visit. Once we have a routine down, we’ll have a better sense what hours make sense for Kevin to have visitors. As Kevin’s time at Magee comes to a close, we wanted to especially thank everyone at Magee for their hard work to get Kevin ready to make this important transition. 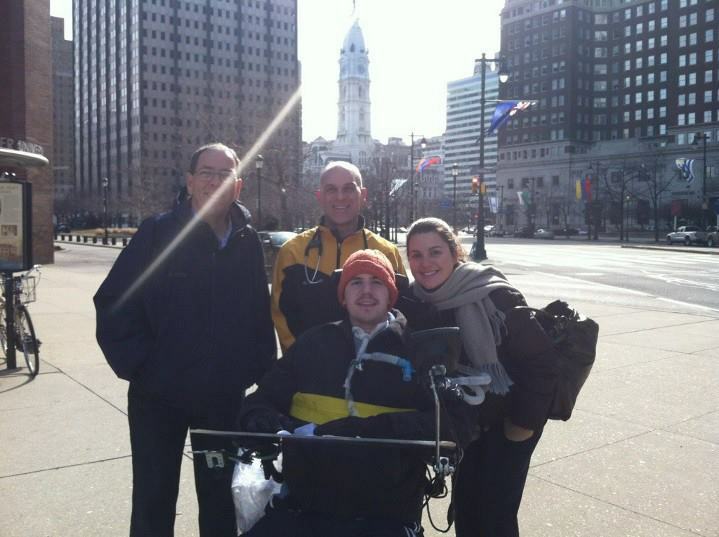 Just yesterday, Kevin got out and about in Philadelphia for the first time since his injury with some of the team he has been working with, including Dave (respiratory therapist) and Amanda (occupational therapist). 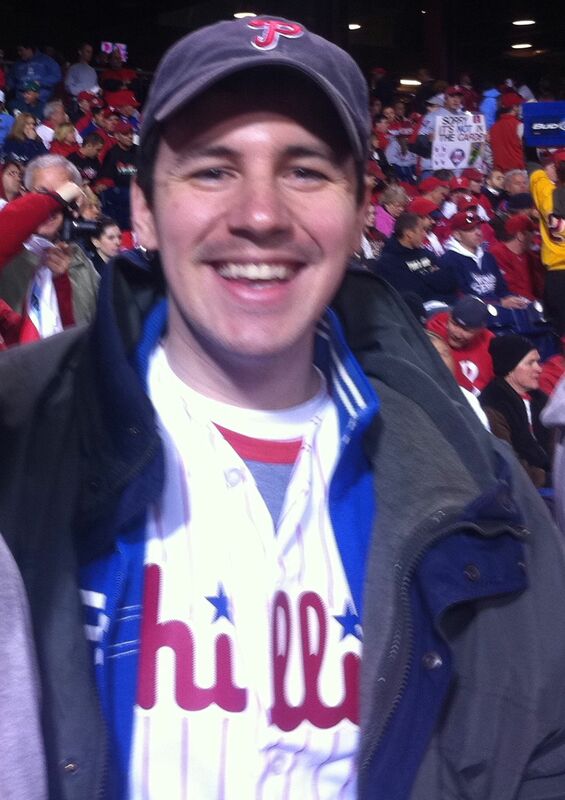 You can see Kevin having a good time in the city he loves in the picture below. Not pictured here is Alli (physical therapist) and the many nurses, therapists, attendants, and doctors at Magee who helped Kevin along over the past few months. We greatly appreciate everything that they’ve done for him. The experience there will be invaluable. We’ll have more updates in the coming days as Kevin gets settled. Thanks again for everyone’s love and support! Thanks for everyone’s patience recently in terms of updates for the website. We have been focused on fundraising and, most recently, getting everything ready for Kevin’s transition to our dad’s house. It’s hard to believe that will be happening in less than a week! We want to reiterate how deeply thankful we are for everyone’s support. It has been an incredible few months and it’s pretty clear how much love people have for Kevin. With the support of our communities, businesses, family, and dear friends, we have been able to raise over $80,000 so far for the Kevin Neary Trust. We are overwhelmed by the support. That funding is going to go a long way to help Kevin in both the near and long term. We can’t thank you enough. We are also very appreciative of the local news media coverage of Kevin’s story and the continued support of the community for Kevin. We posted the links over at the Friend of Kevin Neary facebook page – check them out! Kevin can’t wait to go home, and we can’t wait to get him there. There has been a lot of preparation going on, both at home and at Magee, for that to happen. We’ve been learning what we need to do to be prepared for Kevin’s transition. Kevin is slated to come home next Thursday, barring any unforeseen changes. For the time being, we’ve set up a temporary space for Kevin, but we are getting the plans ready to put on the addition that will be Kevin’s space over the long term. We’ll be update you as that gets underway. We will have more information on visiting Kevin at home once we get closer to the date and get him accommodated with his new space. And we know many of you will want to help, so we’re working on the best way to do that. Stay tuned. Although we have been focused on getting Kevin home, there have been a lot of requests from folks who want to host additional events to raise money for the Kevin Neary Trust, which we really appreciate. Right now, however, we can’t go ahead with every event considering how much is going on. Details for the events that have already been scheduled are available under the Events tab at the top of the site. Check there for any updates. If there are any major updates, we will put up another post. That’s about it for now. We hope to have more updates as we get closer to Kevin’s transition home! We just have a brief update for today. First thank you to everyone who made last night’s event a huge success. Thanks to your generosity we raised just over $21,000! A note on visiting Kevin today: Kevin had a difficult time sleeping last night and a pretty early morning. He asked us to let everyone know that he will be going to bed early and wont be able to have visitors for the rest of the evening. We’re very excited for tomorrow’s event at Boothwyn Fire Company! We have sold out and expect the venue to be at capacity. The event will run from 6-9 p.m., and we encourage everyone coming to think about carpooling as parking may be tight. The ticket price includes food and beverage. We are in the process of getting raffle and auction items together. If you have a raffle item you’d like to donate but haven’t arranged a pick-up, please contact JP (nearyjp@gmail.com). While we appreciate everyone’s desire to come out to support Kevin, we also don’t want to create a fire hazard (at the fire hall – we hear they’re sticklers about that sort of thing). If you were not able to get tickets, there will be an event on March 16th at the Upper Chichester Recreation Center that we hope you will be able to come to. Please contact Joan Morrison (upperchirec@yahoo.com) for more information. to donate electronically. We appreciate all of the support thus far. Click the Friends of Kevin Neary like page to the left to sign up. That’s all for now. Kevin’s continuing his rehab (in typical Kevin good humor) and we’re gearing up for the event this Saturday. We can’t wait to see folks on Saturday. We’ll have more updates soon!